Jackie Fo: Turkey...and risotto...Holy Yum. Good morning and Happy Monday! Even though I stayed up way too late watching episodes of my new favorite show Homeland (I'm obsessed), I woke up in a good mood ready to have a productive week! Which is better than how I felt last week in my post-DR fun coma ready to do about zero work. 1) I haven't done a whole lot of cooking lately due to general busyness. I missed it. 2) We never really had a Thanksgiving dinner in the DR. They tried and did a good job planning a beautiful Thanksgiving dinner by the pool at the resort, but they ran out of turkey in the first 20 minutes. Whoops. For my big meal, I decided to make a turkey. Okay, okay, not a real turkey, but a bone in turkey breast with a pop up timer and everything! 6 whole lbs! It was my first time and I have to say it was easy thanks to a foolproof recipe from the always reliable Barefoot Contessa. This herb-roasted turkey breast recipe was excellent and I followed it exactly, no changes except more garlic. Always more garlic. This took about 2 hours to cook and despite the grossness of stuffing the herb paste under the skin (ew), I was a big fan. The turkey turned out moist and delicious, not a dry piece in the whole bird. Next time I would add more white wine in the pan to add a little more pan juice for the turkey, but that's my only advice. Oh, and be sure to use fresh herbs for this one, don't skimp as I usually do and use the dried herbs. It's worth it for this. One of my absolute favorite food items in the whole wide world is risotto. I just love the whole cooking process, the creaminess and the fact that you can add just about anything to it and it tastes delicious. This time I added one of my favorite fall/winter flavors this time, butternut squash. Side note, I've chopped a whole butternut squash one time and that will be the last time. I almost cut my fingers off...read: not worth it. They've got perfectly fresh diced butternut squash ready in the produce section, probably cut with a big machine to protect people's fingers. I based my risotto of this simple recipe, and added my own touches. Big changes were more Parmesan (always more Parmesan), pinches of nutmeg and more wine right before serving. Sometimes the risotto can get gummy and dry after it's been in the pot for awhile, so the white wine moistens the rice along with giving it more flavor. And be sure to stir, stir, stir. Saute the squash and onions in melted butter. Add the rice and wine, and spoon in the broth a few ladles at a time. Add your freshly grated parmesean in the last few minutes of cooking. I find the stirring process (although lengthy) relaxing, and I love seeing how puffed up and creamy the risotto gets. Complete meal...it looks a bit colorless. Whoops. I made a pretty salad with romaine lettuce leaves for a pop of color, and let's face it, we needed some veggies. For the table, I did simple green and red decorations complete with M and M chocolate chip cookies as a centerpiece. I was also excited to use my "Cheers" glasses from CB2 for the first time. Aren't they the best? I used them with my favorite drink of choice, LaMarca Prosecco. While I was cooking, Mr. Fo took a Sunday afternoon nap. I'm a big nap fan myself, so this was cool with me. Plus cooking time is my "me time." We ate a lot of cookies...and gave a lot away. Side note the cookie recipe was the Nestle Tollhouse chocolate chip cookie recipe with holiday M and Ms added for festiveness (about 1/2 the bag). Let me do what I do best, search the Internet obsessively and email you a plethora of resources, ideas and bargains to make your holidays the most festive ever. Basically, online consulting is my jam. Just ask my latest online consulting client, Patricia who said the nicest things about me below! And she became an Internet friend in the process, btw. See, you can get custom party planning help and a new friend all rolled into one! 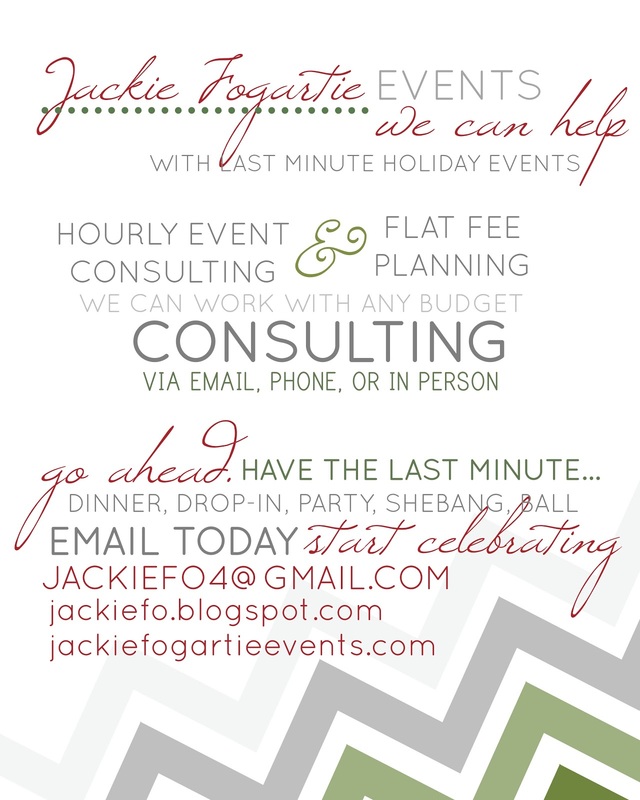 "Jackie was so much fun to work with and helped me pull off an amazing birthday party for my husband! She's creative, thorough, energetic, and most importantly, available when you need her and there to calm your nerves when you're overwhelmed and frazzled with the planning process. Having her as a virtual consultant was like having her in person- she was absolutely wonderful!" So, to conclude, contact me for your holiday party needs (no matter where you're located), and make risotto asap. You'll thank me! Always more garlic, and always more cheese…most definitely. Congrats on your new online venture! I hope it all works out well for you!